Based on Aeschylus’ 2500 year old play and made new by David Grieg, THE SUPPLIANT WOMEN is a short choral movement in three acts. It tells the tale of 50 women who arrive in Argos, the land of their ancestral Gods, seeking refuge from forced marriage with their Egyptian cousins and the perils of their exile. To open proceedings, the cast hark back to the days of Greece, where a list of patrons is read aloud. In this case, Ben Caldwell of the Caldwell Group, a Patron of The Royal Exchange, delivers a eulogy before sacrificing a bottle of red wine on the alter that is the stage. Performing in-the-round can always be difficult, especially for a large ensemble. 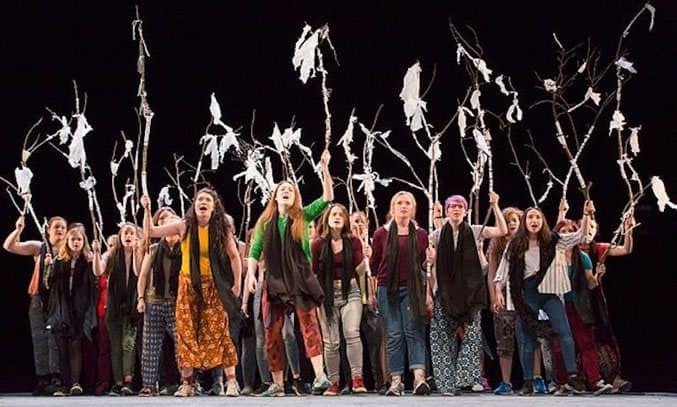 There are 35 young women between the ages of 16-26, and they all need to direct their voices to the whole theatre. Yet this is something that chorus leader Gemma May does very well, as well as the added citizens and Egyptians, adding up to a cast of 78. All the chorus are volunteers as they would be in Greek times, although all are all trained in some way and this shows in their powerful voices and ability to move around the stage. Oscar Batterham offers comedy in his role as King, bringing light to the play even though he is struggling with a decision that could change his land. This leads to the creation of democracy, allowing the citizens of his city to decide the fate of the Suppliants who wash up on his shores. The word Suppliant means a person in need who asks another for the help or hospitality. In this play – the first of three written by Aeschylus – sees the women leave everything behind to board a boat in North Africa to and flee across the Mediterranean hoping for protection and assistance, seeking asylum in Greece. Play two: THE EGYPTIANS and play three: THE DANAIDS have been lost to time although snippets of story passed through generations leads to a rough synopsis of the trilogy. It is believed that the Egyptians arrive and start a war to claim back the women for themselves. Eradicating the city of Argos, the democratic decision to protect the refuges ultimately ends badly. The women make a pact to murder their captors (husbands to be) and all but one does this. The woman’s father and the 49 sisters put the woman on trial for failing to follow the pact, which in turn is interrupted by the goddess Aphrodite, who champions love and marriage. Yet while for the most part, the performance is powerful, the story is a little confused. The actual text may champion women rights and equality but this performance seems to send mixed messages. The women are running from their male cousins who want to force them into marriage. They cry that the men are evil and they wish them dead, yet they ask the men of the host city Argos they seek asylum in for protection? The under current of religion is used as a threat too. If you protect us, Zeus will be good to you, if you don’t he will be angry. Strong independent women shouldn’t have to use emotional blackmail and religion to gain support for their cause. They take their war to another country expecting someone else to fight it for them. Yet they don’t listen to the advise of their hosts. All in all, it’s an odd watch and no-one really leaves talking about what they had just experienced or how it made them feel because it’s confused. That said, the Movement Director Josephine Hepplewhite does an amazing job of moving a large cast gracefully around the stage and there are a few visual artistic moments that are very clever, particularly making the Goddess out of scarves. The musicians Ben Burton and Callum Armstrong also strengthen the performance with their use of traditional double reed pipes and percussion instruments. THE SUPPLIANT WOMEN runs at the Royal Exchange Theatre, Manchester until 1 April 2017.